Properly installed, an Indian sandstone driveway is a durable long-lasting surface that can withstand virtually any amount of traffic. With the right slope, good drainage and regular maintenance, the paving stone can handle winter’s ice and snow with ease. Giving the stone paving a thorough cleaning before Old Man Winter rounds the corner is the most important part of pre-season maintenance. Follow these steps to help keep your Indian sandstone drive slip-free and stylish all winter long. Sandstone paving is one of the most beautiful types of stone a home-owner can use for their property and Indian sandstone paving is exceptional in its beauty. Some colours include; light and dark greys, grey greens and cream & beige. 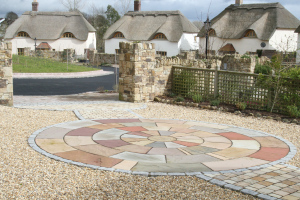 Sandstone paving materials not only come in a variety of colours but also a variety of shapes including circular, square, oval and a variety of sizes two, three, four and five meter sizes. Most people don’t pay attention to paving stones, paving supplies, paving slabs their driveway paving stones until it is in a really bad state. 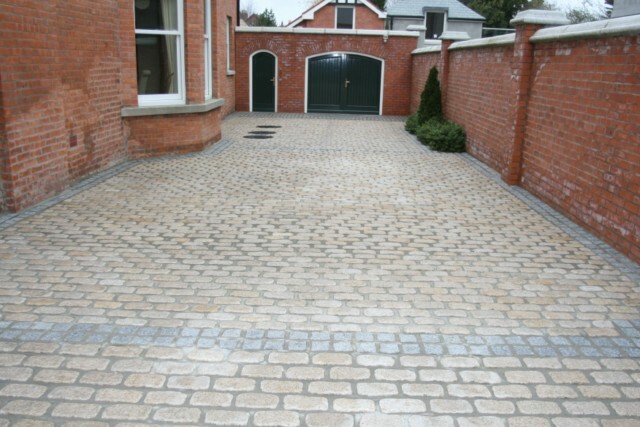 Natural paving stone is the most durable option for your driveway paving. However, like almost everything, there comes a day, when you need to change it. Have you reached this point, where you’re paving looks old and worn out? Start by finding out if your driveway paving slabs need to be replaced. Look and see if there are stains on your paving slabs. If a sealant wasn’t applied to the paving stones, then they are more likely to be stained. For example, petroleum products that leak from vehicles may have damaged the colour of the stones. Paving stones may also be subject to uneven settling or deterioration. You want to make sure that you are choosing the best paving supplies to avoid such undesirable effects. To learn more about how to protect your driveway paving and read the signs, click here. If you are unsure of what the best next step is for your paving, ask the experts at SN Granite. We will give you the best advice in terms of what to replace. At S&N Granite we offer top quality paving supplies for garden, patios and driveways. 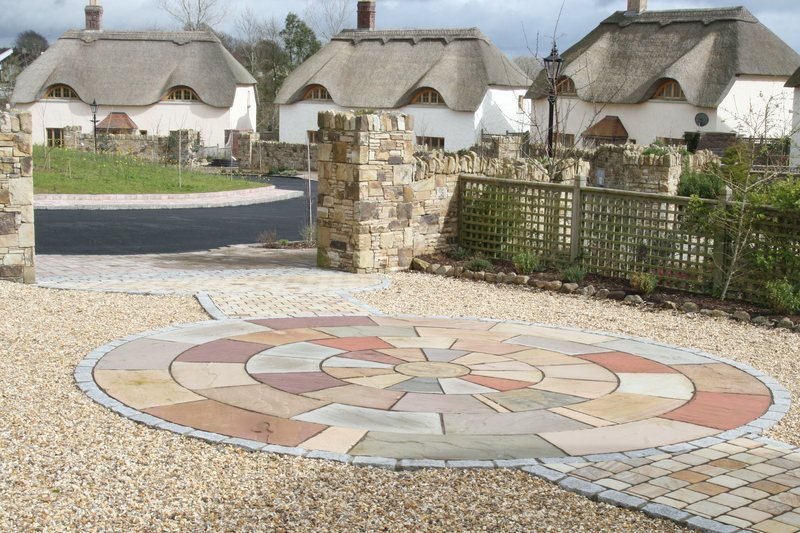 We will also ensure you choose the right paving slabs for your driveway. Contact us now or visit or paving display area, only 1 hour from Dublin. Click here to read the full paving article on our website. The subtle texture and colouring of Indian sandstone is making the stone a popular choice for paving drives, patios and paths. When choosing materials for outdoor garden and patio areas it is important to choose stones that will stand up to Ireland’s climate extremes. Installing Indian sandstone paving is both an art and a science. Designs take a keen eye and an artistic sensibility. Ensuring that the gap between each stone is uniform and regular takes skill and experience. With the assistance of the right stockist, homeowners are sure to achieve the right outdoor ambiance with Indian sandstone paving. 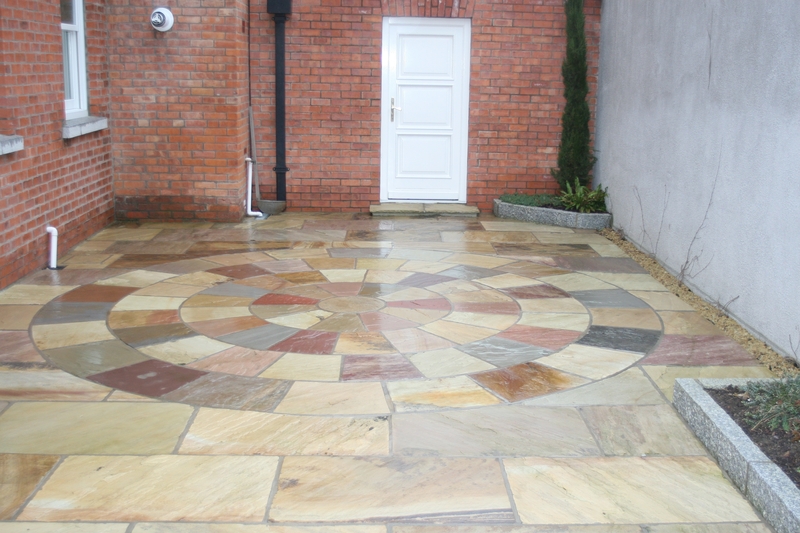 Indian sandstone Ireland is available in a variety of colours and textures. Indian sandstone has a natural, rustic appeal, but as it has an uneven surface, it requires expert and precise handling something that S&N Granite have become known for. At S&N Granite our stone masons have extensive knowledge of each material to ensure they understand the technique when working with these natural stones. This allows us to create the perfect Garden paving patio tiles to suit your home and will last for years to come. Click here to read full article on how Indian Sandstone can create outdoor ambiance. You can also visit our website if you have any queries or visit us at our wonderful showroom and outdoor display area in Camolin, Co. Wexford. At SNGranite there is nothing more that we love to do than give friendly advice about stone paving and stone cladding. Our experts here in Enniscorthy, Co. Wexford Ireland are dedicated to helping people improve their garden and courtyard spaces. In our latest article written by Michael he gives advice on ow to lay a stone paving path. From the first step of planning your design. It is important to put your own individual touches to this and when your friends come around and admire your handy work you will feel great. Secondly Michael explains how to prepare the surface for laying your paving slabs, what to look out for and what to expect. Finally, he walks you through the laying of the stone paving. If you would like to read this beautifully written info article on laying a stepping stone path click through here to our Stone Paving info centre. And while you are there you can check out some of our other 100 articles on stone paving, window sills and stone cladding! We really hope you enjoy this. When it comes to making a big decision like changing the paving of your terrace or courtyard or starting out on creating a new area in your garden. It is going to be very important to research and identify exactly what it is you want in your patio area. It is not something you are going to change in a years time! S&N Granite are very aware of the above and have been actively publishing articles on everything that you need to consider when investing in Stone Paving for your garden. Read our latest article here which explores ideas around designs etc that you may wish to implement in your paving project. Click through to our extensive Info Centre on SNGranite.ie and you will be sure to find many articles that will help inform your decision when it comes to making that big decision. Please Follow us on Facebook, Twitter and Google+ where we regularly update on events, news and info! The paving material that you choose for your garden will define both the functionality and the style of the space. S&N Granite explore some of the options you can look at when facing the dilemma of choosing stone paving for your garden project. Garden paths, patios and terraces not only need to stand up to foot traffic but to the constant assault of sun, wind, rain and snow too. For its durability and resistance to weather, stone paving is a supremely practical choice, and it’s hard to match natural stone for sheer beauty as well. The following tips can help you select the stone paving material best for you. In this article which can be found on our website we look at limestone paving, granite paving and slate options. 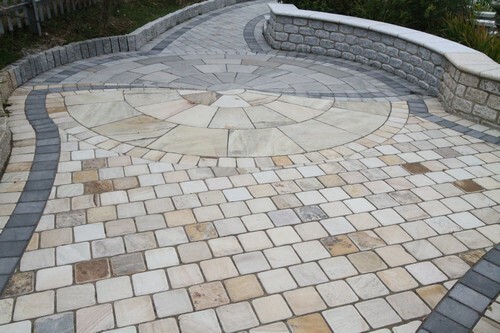 We supply and fit one of Ireland’s largest ranges of stone paving. Check out our new website and get some great ideas for paving projects in our garden and paving display area. You can always contact one of our paving specialists by phone or email and we would be delighted to talk you through the pros and cons of the various types of paving materials available on the market today.